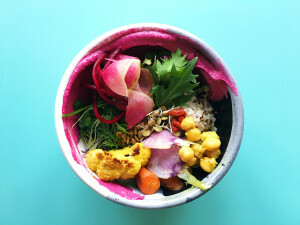 This being food, you also want it to taste good, and Volger’s new book, Bowl: Vegetarian Recipes for Ramen, Pho, Bibimbap, Dumplings, and Other One-Dish Meals, aims to deliver on that front. He traces the impetus behind the project to a revelatory dining experience he had in Brooklyn about five years ago. “I got obsessed with this vegetarian ramen at Chuko, in Prospect Heights,” he recalls, noting that most meatless versions found elsewhere typically read as an afterthought. 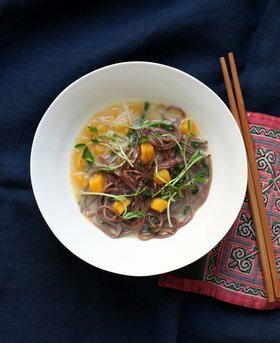 But that rich, flavorful meal, anchored by a seaweed-rich kombu broth, inspired him to tinker with other classic dishes from around the world. Bring a saucepan of salted water to boil. Add the bok choy and cook until the thickest parts of the stem are tender and can be easily pierced with a paring knife, 2 to 3 minutes. Transfer to a plate with a spider skimmer, reserving the cooking water. Add the peas to the water and blanch for 30 seconds, just until the raw bite is gone. Transfer to a plate with a spider skimmer, again reserving the cooking water. 4. Add the noodles to the boiling water, in a strainer basket or the strainer insert that comes with your stockpot if you have one, and cook until tender, usually 4 to 7 minutes or according to the package instructions. Lift out the noodles, reserving the cooking water, and thoroughly rinse the noodles under cold running water in order to remove excess starch. Quickly dunk them back into the hot water to reheat. Divide among four bowls. 5. 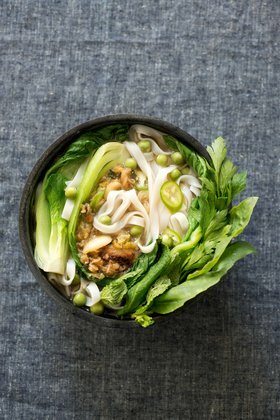 Top the noodles in each bowl with the bok choy, peas, caramelized onion mixture, and chilies. Ladle the hot broth over each serving. Serve immediately, passing the herbs and lime wedges at the table. 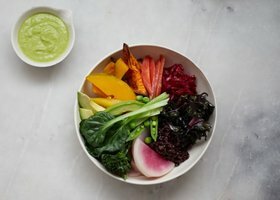 Since leaving Navy, the jewel box of a seafood restaurant in Soho, chef Camille Becerra has begun laying the groundwork for a cookbook and other projects, and is in residence at Café Henrie in the meantime. 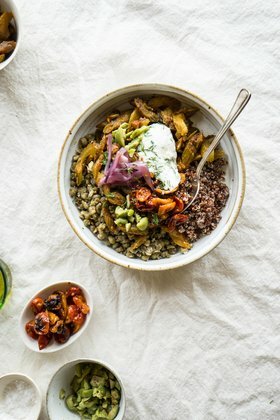 Since her Dragon Bowls change with every order—the one pictured here includes chickpeas, roasted vegetables, mizuna, herbs, lentil and fenugreek sprouts, roasted seeds (pumpkin and sunflower), pickled goji berries, and beet tahini sauce—she shares the recipe for the simple yet transformative coconut grains that form the base of the dish. “They are so delicious, even by themselves,” she says. You can follow the same directions as making kimchi here (using only red cabbage) or find the recipe for pink kraut in my book. I love this brand. You can find it along with other naturally fermented vegetables in the refrigerator section of your health food store. The creative force behind The Jewels of New York, an NYC-based culinary consultancy and catering outfit, Diana Yen regularly works with the magazines Kinfolk and Cherry Bombe, has collected her recipes in a handsome cookbook called A Simple Feast: A Year of Stories and Recipes to Savor and Share, and is collaborating soon with the Brooklyn pie shop Four & Twenty Blackbirds. Given her wildly popular Angora bunny, Cleo, we can only hope the result is carrot-flavored. 3. Using tongs, divide the noodles evenly among bowls, then ladle in the soup. Serve immediately with green onions, red pepper, and pea-shoots.